I rarely get on a soapbox. ESPECIALLY when it comes to gramar or the english language. I would get fired if i called myself the grammar police. Honestly, I just rarely care if you use than or then, accept or except, etc. I don't feel the need to fight that battle. I have plenty other things I want to fight about focus my energy on. 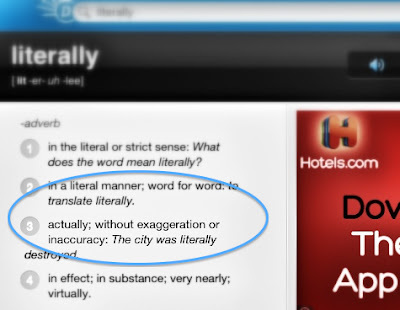 But today, I just wanted to share, gently, with my readers the definition of Literally and Figurative so that you know that you didn't "literally die" or you weren't "literally run over"... unless you were actually literally dead or run over. 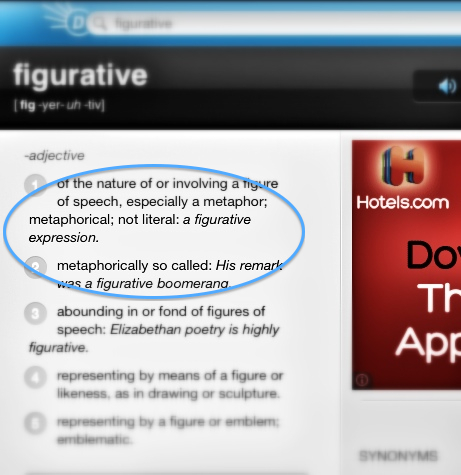 So, I thought I'd let the definitions of these two words speak for themselves. No judgement. I just want to educate people as the correct definitions to these two words. Lol! That is a HUGE pet peeve of mine! I'm always like, really?? You literally died??? But you are here!! Good post! Hahahahaha I love this! Mostly because I am a terrible offender! I am emailing this to my husband, he's going to crack up! I really need to stop saying it - but remember when "like" was really popular and people (I almost wrote literally) could not stop saying it?! That's how I feel!